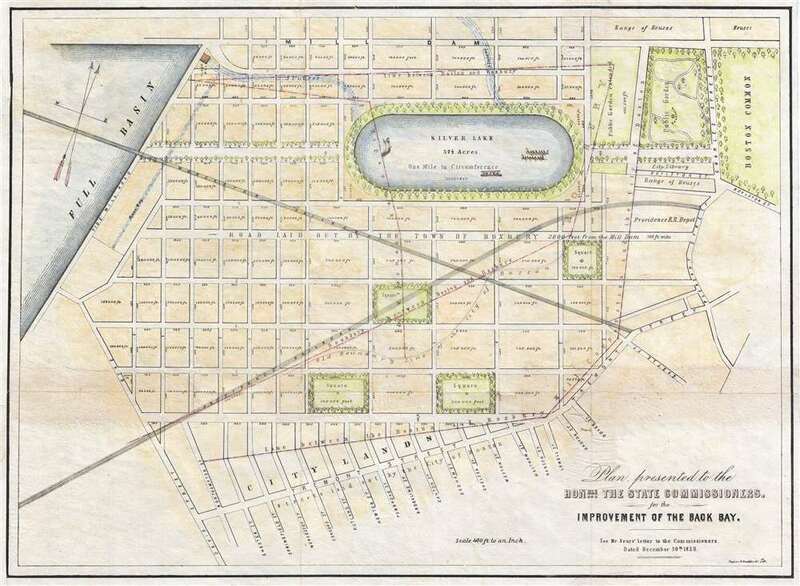 Founding document for the Back Bay, one of Boston's most beautiful neighborhoods. Plan presented to the honble. the State Commissioners for the improvement of the Back Bay. The most notable feature in Sears’ plan is the construction of a large oval 37 1/2 acre lake just west of today’s Boston Public Garden. In the first Sears’ Back Bay proposal, dated 1849, this lake was more circular and consumed some 7 acres. In the second Sears proposal of 1850, it was reduced to the present acreage. Imagining it would greatly increase the property values in the Back Bay, Sears’ spent more than 10 years promoting the idea of Silver Lake. The lake, at least, proved popular among mapmakers, appearing on many early aspirational plans of Boston, including those of J. H. Colton. Despite surpprt among the weathy of Boston, the plan was ultimately rejected, ironically for some of the same reasons that Sears championed it. Sears claimed the lake would be a great health benefit, while the state argued that it would not only take away public lands, but also quickly fill with ‘sediment and filth.’ The plan for Silver Lake was formally abandoned by 1855. Sears still made a fortune on the landfill project, but his lake never materialized. Sears nonetheless remained an active member of the Chairman of the Back Bay Commission and influenced the ultimate completion of the Back Bay project. This map was published in 1852 to accompany documents issued for the Massachusetts State Senate. It was engraved and published by Tappan and Bradford, lithographers. David Sears II (1787 - 1871) was Boston based businessman and real estate developer active in the middle part of the 19th century. Sears lived in a large granite mansion, now the Somerset Club, at 42-43 Beacon Street, in Boston’s prestigious Beacon Hill neighborhood. At the time, the Sears mansion, then a free-standing home, was the most valuable private mansion in Boston. Sears was instrumental in a number of major Boston area real-estate developments, including the construction of the Longwood neighborhood of Brookline and the Back Bay landfill. Sears was able to trace his family in Boston to 1630 and was married by marriage to the Winthrop Family, linking him to the first Governor of the Massachusetts Bay Colony, John Winthrop. In 1844 his gift of $10,000 rescued Amherst College during a difficult time and marks the beginning of the Sears Foundation of Literature and Benevolence. Massachusetts. General Court. Senate., 1852 (no. 45). Very good. Backed on archival tisssue. Left Margin extended. OCLC 459742043, 15637529. Boston Public Library, Leventhal Center, G3764.B6:2B2 1852 .P5.